Inspired by layettes popular in the 1940's and 1950's, this darling layette features delicate hand embroidery with just a touch of smocking. The pattern includes a long gown with smocking at the bias bound neckline, a back opening and long sleeves with elastic at the cuffs. The robe and jacket feature a front snap opening with optional ribbon trim, long sleeves, and delicate hand or machine embroidery. 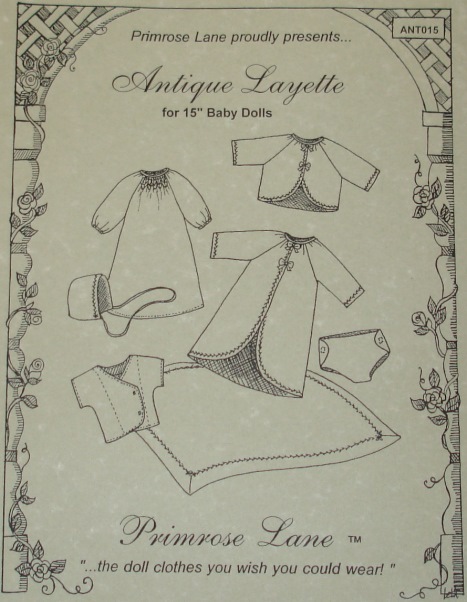 Pattern also includes a sweet little bonnet, embroidered receiving blanket, undershirt and old fashioned "nappies" (diapers). Beautiful made with batiste, and extra cuddly made with flannel! Designed to fit Bitty Baby by American Girl or other 15" dolls with similar size/shape.